The second portion of a new poll explores Gov. 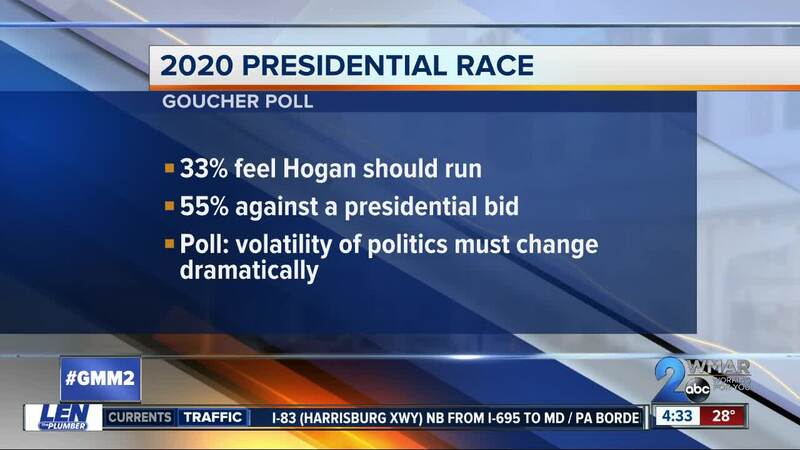 Hogan's approval rating, a possible bid in the 2020 presidential race and how Marylanders view President Trump. The second part of a new Goucher Poll looks into Maryland Governor Larry Hogan, the General Assembly and President Donald Trump. The governor has been recognized as one of the most popular in the country and this survey shows that trend continued. 69 percent of Marylanders approve of the job Hogan is doing as governor. 14 percent disapprove and another 14 percent were not sure. 66 percent say “keeps his promises” describes him and 16 percent say it does not. 67 percent say “cares about the needs of people like you” describes him and 22 percent say it does not. 85 percent say “is likeable” describes him and 7 percent say it does not. 70 percent say “is honest and trustworthy” describes him and 13 percent say it does not. 79 percent say “works well with both parties to get things done” describes him and 10 percent say it does not. 80 percent say “can manage the government effectively” describes him and 11 percent say it does not. 65 percent say “puts the state’s interest ahead of his own political interests” describes him and 19 percent say it does not. Despite his popularity, only a third of Marylanders feel Hogan should run for president against incumbent Donald Trump in 2020. 55 percent are against him entering the race. While Hogan receives favorable views from Marylanders, Donald Trump isn't receiving as much support. 30 percent of Marylanders approve of the way the Republican president is doing his job leading the country, while 66 percent disapprove. Just 19 percent of people surveyed feel Congress is doing a good job, and 74 percent believe Congress could do better. 73% say they can trust the state government “some” or “all” and 22% say they can trust it “none” or “very little” of the time. 34% say they can trust the federal government “some” or “all” and 64% say they can trust it “none” or “very little” of the time. Click here to read all of the results from the latest Goucher Poll.